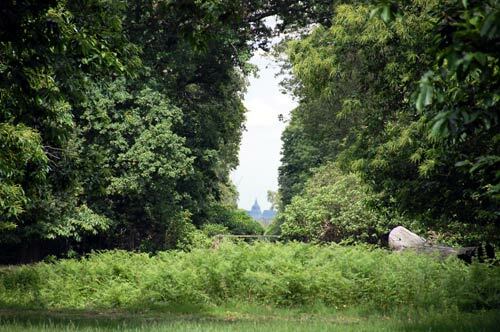 This short walk (1.5 miles) is from Pembroke Lodge in Richmond Park, taking in the best views from Richmond Park, plus an optional extension to see the famous view from Richmond Hill. Highlights Good views. Wildlife: deer and parakeets. Pembroke Lodge. Starting from the Pembroke Lodge car park, enter Pembroke Lodge and turn right to find King Henry's Mound. King Henry's Mount offers an unbroken view all the way to St Paul's Cathedral in Central London. This is a protected view by law, so no buildings can be built to obscure this view and all trees must be cut back. Head out of the gate on to the main path around the park (the Tamsin Trail). Continue left towards Richmond Gate. Immediately after Pembroke Lodge gardens is a small bench with a lovely view south over Twickenham, Kingston and on to the North Downs. Continue walking on the Tamsin Trail towards Richmond Gate. At Richmond Gate there is the option to leave the park for the famous view of the River Thames from Richmond Hill. This is a 10 minute round trip, with the option of a drink or lunch at the Roebuck pub. From Richmond Gate, leave the Tamsin Trail and follow the path next to the road. After approximately half a mile there is a lone bench by the side of the road offering spectacular views of the London skyline from the Wembley Arch to Canary Wharf. Return diagonally to the car park at Pembroke Lodge.